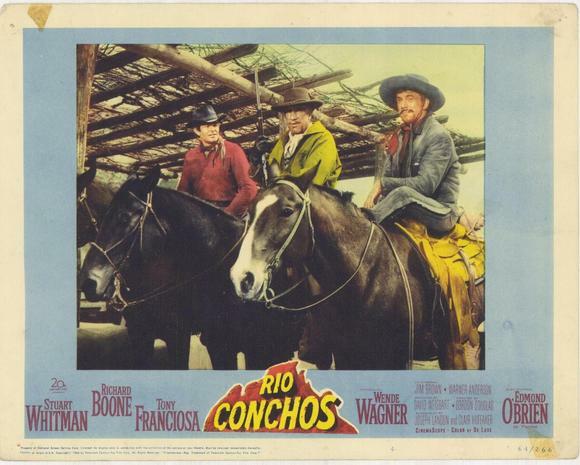 RIO CONCHOS: American Western, Italian Moodiness – Schlockmania! The conventional wisdom on the difference between Hollywood westerns and spaghetti westerns is that Hollywood westerns were usually simplistic “white hat vs. black hat” affairs, at least until The Wild Bunch ushered in a tide of revisionism, and the spaghetti westerns cornered the market on moral darkness and complexity. However, a careful exploration of Hollywood’s pre-Wild Bunch western output will reveal more than a few morally ambiguous gems. Rio Conchos is a good example of how even a mainstream Hollywood western could bring plenty of grit and darkness to the table. Its takes place shortly after the Civil War and its plot revolves around a cache of rifles stolen from the Union Army. Captain Haven (Stuart Whitman) is responsible for their loss and arrests Lassiter (Richard Boone), an ex-Confederate soldier who used one of them to kill a bunch of Apaches. Lassiter reluctantly reveals that they are in the possession of Pardee (Edmond O’Brien), a former Confederate officer who has fled to Mexico. Haven and Lassiter form an unlikely partnership: Haven wants to clear his name by getting the guns back and Lassiter just wants to get out of the brig. Haven brings along Sgt. 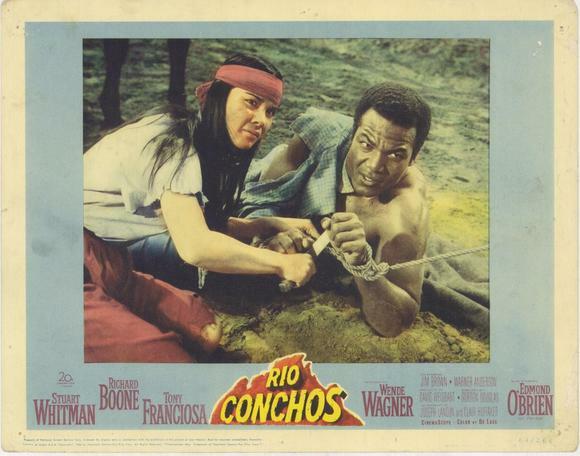 Franklyn (Jim Brown) while Lassiter insists on bringing along Mexican bandit Juan Luis Rodriguez (Tony Franciosa) because he knows his way around and can also speak Apache. The quartet ventures into no man’s land on their secret mission, encountering plenty of violence and craziness as they work their way towards Pardee. It is revealed that Pardee wants to restart his war on the Union with Apache help – and our four mismatched heroes are the only ones who can stop him. The end result is surprisingly tough for its era. 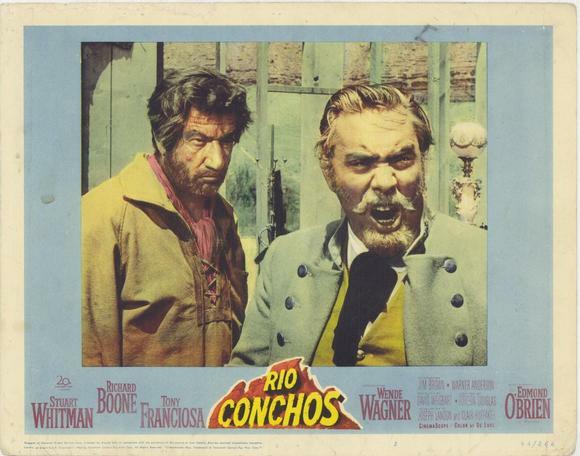 Rio Conchos doesn’t have a spaghetti western influence to it (the Leone era had only just begun) but it has a gritty, uncompromising quality to its characterizations that distinguish it amongst Hollywood westerns of the early 1960’s. The characters of Haven and Franklyn might give us square-jawed heroes we can relate to it but it’s Lassiter and Rodriguez that really drive the story – and they’re as complex and morally ambiguous as any Spaghetti Western characters you care to mention. The storyline doesn’t go easy on the audience, either. The heroes deal out the expected gun-oriented violence (Rodriguez is pretty handy with a knife, too) but there are some rather grim tableaus throughout the film: without getting into too many spoilers, deaths of innocent civilians figure into the story and a grim scene of torture late in the story offers an unexpected shock. Lassiter is also pretty brutal when it comes to violence: he’s introduced shooting down Apaches in cold blood while they perform a funeral rite. The tough guy aspect of the film is furthered by a quartet of strong performances by the heroes. Whitman shows his leading man chops here, offering steady work as the nicest of the good guys, and Brown shows his future action star prowess in a perform ance anchored by his quiet but menacing presence. That said, the really fun performances come from Boone and Franciosa. Boone delivers a convincingly lived-in performance as the sarcastic and brutal Lassiter, who slowly learns to respect his Union allies when he sees the horror his fellow outlaws are capable of. 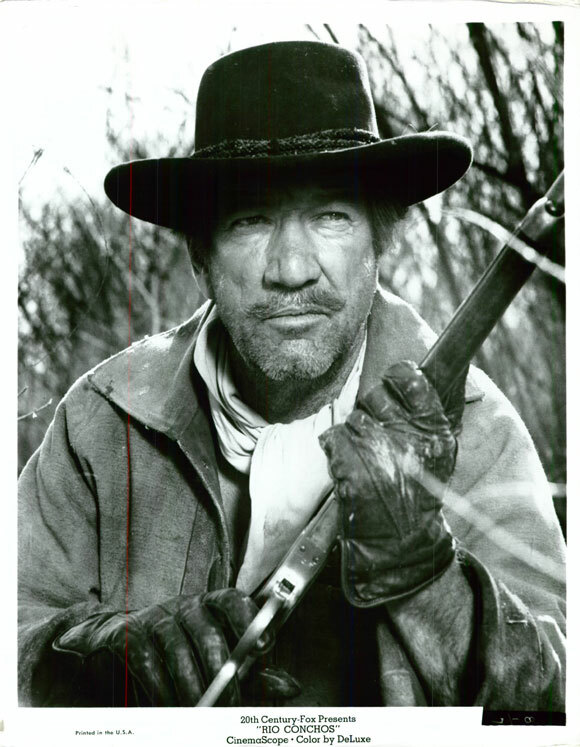 Franciosa offers a nice contrast as Rodriguez, laying on the “smiling bandit” charm but also allowing the audience to see how duplicitous and violent his character can be. O’Brien also deserves praise for his flashy turn as the film’s villain, Pardee: he’s kept offscreen until the finale but he makes every moment count during the finale as he creates a vivid portrait of Southern pride run amuck (he also has a great introductory scene). Finally, Wende Wagner offers a notable turn as an Apache captive who is slowly won over to the heroes’ cause. Despite the “white woman painted up as an Indian” nature of her casting, she manages to bring a surprisin g intensity to a mostly silent role. 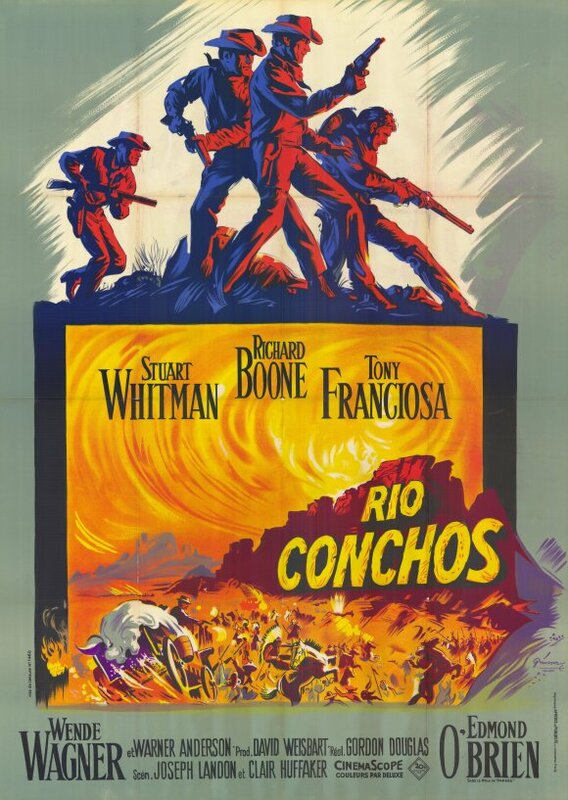 Finally, Rio Conchos benefits from sharp, visually elegant direction by Gordon Douglas. This journeyman studio director has both classics (Them!) and infamous duds (Viva Knievel) on his repertoire but his work is inspired here. The action and performances he captures on screen have the proper toughness to make the storyline work and he also uses the cinemascope frame to strong effect, deploying angular compositions to bring a sparse yet attractive style to the proceedings. Better yet, he uses his major studio resources to lend heft to his visuals: the best example of this comes during the finale, in which the insanity of Pardee is conveyed by how barks out his orders from within a rickety, half-constructed version of an antebellum mansion in the middle of the desert. The production design adds a vital visual punch to those moments and Douglas uses it with imagination and skill. 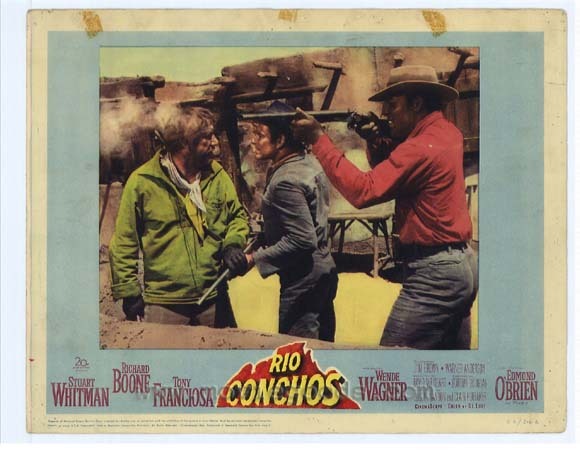 In short, Rio Conchos is a winner for Western fans, delivering the action and machismo in a way that proves Hollywood westerns could be as tough and uncompromising as their Italian counterparts. Anyone who likes spaghetti westerns will find it easy to get into the grim style of sagebrush cinema on display here.